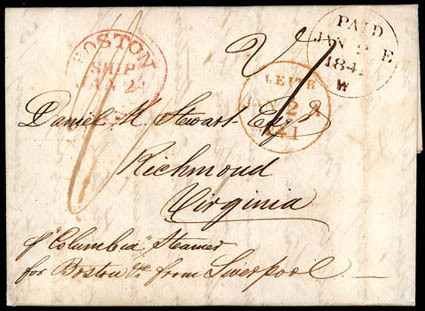 1841 (Jan. 2) Leith, Scotland to Richmond, Va., folded letter with red "Leith Jan 2, 1841" cds with red manuscript "1/-" shilling prepaid packet rating, red London (1.2) transit, carried as endorsed by Cunard Line Columbia from Liverpool Jan. 5th to Boston arriving Jan. 21st, red "Boston 'Ship' Jan 21" cds and manuscript "27" due rating for 25¢ inland postage plus 2¢ ship fee, Very Fine, Letter carried on Maiden Voyage of the Cunard Line Columbia., ex-Winter. "Columbia" was the last of the original four wooden, side-wheel paddle steamers with which Samuel Cunard start the operations of his line in July 1840. She was 1,175 tons and built at Greenock in 1840. She ran aground and was wrecked at Cape Sable, Nova Scotia on July 2nd 1843 without loss of life. A link back to Sale 75 - Lot 193, along with its description, will be appended to your message.